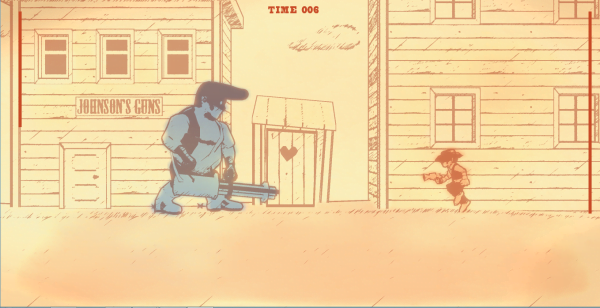 Gunman Clive is a cartoony Wild West platformer-shooter hybrid, find out what we thought of it in our review! I never thought I would catch myself typing this, but…there sure are a lot of indie games these days, aren’t there? I’m certainly not complaining; over the last year or so there have been as many, if not more, indie games I’ve cared about as big-budget mainstream titles. This new flood of independently made content has made developers try to focus on one or two unique aspects of their title in order to get noticed. It isn’t enough to just make a game on your own and try to get it out there, it needs to stand out with an eye-catching art style or innovative mechanic. In that regard, Gunman Clive at least puts forth a good effort. Gunman Clive is a cartoony Wild West platformer-shooter hybrid previously available for a frankly impressive number of platforms including the 3DS, iOS, Android, and finally making its way to Steam by one-man development team Horberg Productions (the name coming from its sole employee, Swedish programmer Bertil Horberg). The game puts you in the shoes (boots?) of either the titular Clive, a quiet cowpoke with a good pair of sideburns, or the lovely local proprietor Ms. Johnson, on a quest to rescue whichever character you’re not playing as (a trick I loved in the Sega Genesis Ghostbusters game, and one that still works today). This quest to rescue whoever it is you’re rescuing unfolds like any number of adventures you may have taken in the past. You proceed from left to right, jumping over obstacles, blasting enemies, and eating delicious cake (a video game health staple dating all the way back to DuckTales) to regain lost energy. Along the way, you could find a few variations of the standard six-shooter you begin with, like a three-way shot and homing lasers. Surprisingly, though, more emphasis is put on the platforming aspects than the gunfighting. You’re not constantly awash in enemies like you would be in a game aping more of a Contra/Metal Slug feel, and the enemies that you encounter seem to be placed with the intention of augmenting the platform challenges. Many of the obstacles you encounter seem ripped straight from classic and newer Mario games, such as movable ledges you can control by standing on the appropriate arrow, and tiny blocks that fall out from under you if you linger on them. This focus on navigating the terrain rather than engaging in combat gives Gunman Clive a very deliberate pace that helps to set it apart from a lot of 2D action games. The difficulty isn’t much to speak of, despite the occasionally tricky jumping. Ms. Johnson has a float move similar to Princess Toadstool’s which allows her to cross gaps with ease, and both of the characters handle and respond very well to input. And back to Earth, she gently fell! The art style and environments, while simple, are pleasing to look at and stand out amongst the crowds. A film grain effect permeates the entire game that remains noticeable without being intrusive, although the backgrounds tend to get a bit-samey (but this could perhaps be blamed on the western setting). The characters are all well animated and distinctive, yet simple and effective. A two-color palette is used for the heroes that calls to mind DOS-and-earlier PC games, and the bad guys are all spot on game cliché parodies like ducks that pace back and forth. Each ‘world’ is punctuated with a boss fight, and while those are never super difficult, enemies like the “Elvis-with-a-chaingun” that you encounter give the game an almost-Grasshopper Studios vibe. Arne Horberg (presumably related to Bertil in some capacity) composed the soundtrack, which flips effortlessly between frontier twang and chiptune beeping, deserves special mention and really helps maintain the mood. Heck, even the game’s logo looks like it belongs on a pre-video game Nintendo toy package. Sure, his gun is bigger than you are, but you have to respect the amount of time he puts into that hair! 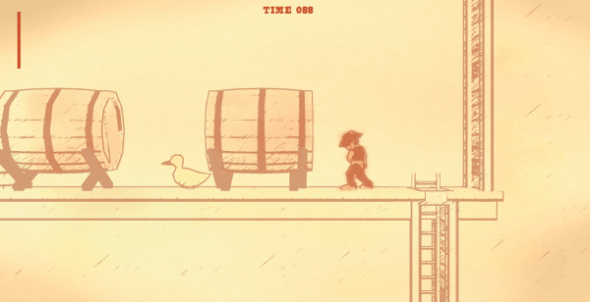 Charming though it may be, Gunman Clive is not without flaws. Difficulty, or lack thereof, may be the biggest one. The enemies come at a pretty gentle pace and you’re given unlimited lives and generous checkpoints, so you could potentially blow through the entire thing in an afternoon if you don’t have much else to be doing. While the gentle pace and simple controls probably do it a world of good on cell phones and maybe even the 3DS, more experienced gamers using a keyboard may find themselves wanting something with a bit more teeth. And yes, I did say ‘keyboard’ – there’s no gamepad support, although the keyboard responds very well, and it’s nothing Joy2Key or Xpadder can’t fix if you’re feeling industrious. I myself prefer playing 2D games with Xpadder and a Sega Saturn controller plugged into a USB adapter, because I’m totally that guy. 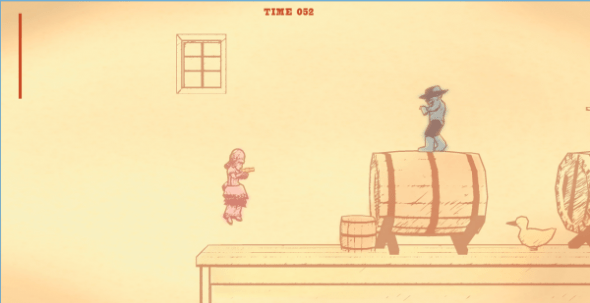 All in all, Gunman Clive is a fun diversion. It’s not something you’ll want to play again immediately when it’s done, and its occasional repetitiveness may cause you to stop playing even before that point. But come on, for a game made by one guy it’s damn good, and any platformer fans looking for something to tide themselves over would do well here. Besides, the Steam version is two dollars. There’s far worse ways to spend two whole dollars.